In a massive coordinated terrorist attack 19 men hijacked 4 jetliners on the morning of September 11. The hijackers were on a suicide mission and had received orders to take over control of the aircraft and to fly the planes into specified targets. American Airlines Flight 11 departed Boston-Logan for Los Angeles at 07:59. The aircraft was hijacked by five terrorists. The hijackers took over control, reportedly switched off the transponder and changed course to New York. At 08:46 the aircraft was flown into the North side of the 110-story New York WTC North tower in a slightly left wing down attitude, crashed and exploded into the 93rd through 98th floors. According to an FAA study, N334AA struck the WTC at a speed of 494 mph; an MIT study however determined the plane was probably traveling at 429 mph. The massive fire weakened the tower structure on these floors and the tower collapsed at 10:28. Most of the office workers below the 93th floor were able to evacuate the tower on time before the collapse. Seventeen minutes after Flight 11 crashed into the North Tower, the WTC South Tower was struck by a United Airlines Boeing 767, N612UA. A total of 2,606 people were killed in the World Trade Center buildings, including about 292 on the ground. 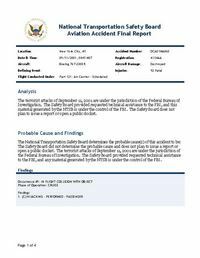 A precise breakdown of the number casualties relating to Flight 11 (North Tower) and Flight 175 (South Tower) is impossible. It has been estimated that about 1600 people were killed on the North Tower, and about 900 on the South Tower. Distance from Boston-Logan International Airport, MA to Los Angeles International Airport, CA as the crow flies is 4164 km (2602 miles).